Ever felt stupid taking a heavy backpack on a short hike? Ever felt foolish for not taking anything on a hike? Felt tired while carrying a huge pack? If the answer is yes, I believe you don’t know about the fanny pack. And if the answer is No, I am sure you have one in your collection. Fanny pack is a handy little bag that is highly practical for a day hike. Those are comfortable to carry and pretty reasonable when it comes to price. One doesn’t always need a large backpack or suitcase for travel. Sometimes, we just have to have something that can keep all our essentials, nothing else. For that, a fanny pack is what support the most. A quality fanny pack is reasonable, comfortable and practical, especially for a day hike. You can even carry them for long trips if you want. Those packs strap around the waist and don’t provide any discomfort. So we decided to review some of the finest quality fanny pack today. Our purpose is to help you find the most effective one within your budget. Picking a fanny pack for hiking is an easy task and tough task. Wondering how? Well, it’s easy, visit the shop, pick one and pay the price! That simple! But when you want a quality product, the process is quite severe and confusing. The market is full of options where majority lacks in quality. If you want a quality product, you have to research which is time-consuming. That’s why we are to present you some option which is the best in the market according to our experts, users and some professionals. 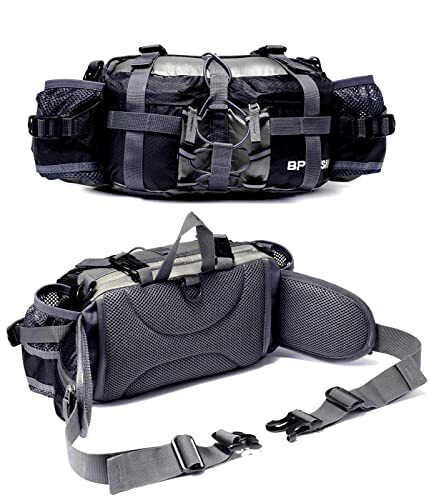 The Bp Vision Outdoor Fanny Pack is on top of our article. Though we don’t have any particular order, still it is in the first place due to some vital facts. First of all the construction quality is fascinating with high-quality, water-resistant nylon and breathable mesh lumbar padding. Meaning, it is highly durable as well as comfortable. 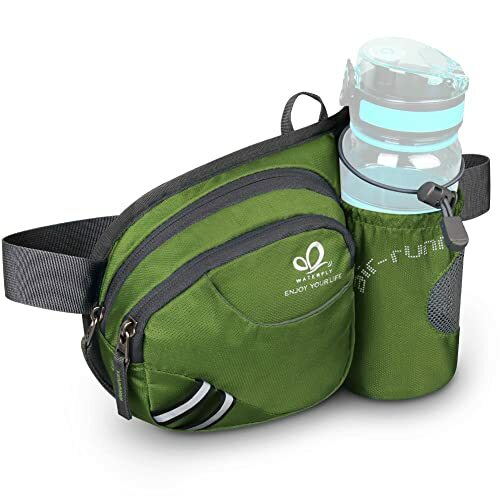 The fanny pack features dual water bottle holders to keep a water bottle and also has two exterior front zipper pockets along with exterior side zipper pockets. Each pocket has plenty of rooms where you can keep your stuff well organized. The pack also has two extra shoulder straps. You can carry it in 3 different ways such as hip back style, using shoulder straps and using the backpack straps. So, we can say it is a multipurpose option. Overall, the price is pretty good for such quality. The WATERFLY Hiking Waist Bag has safe and breathable strips that makes it different from the other products in the market. It is visible even in the darkest hour of the night. The construction quality is strong with water-resistant nylon material making it a decent choice even in the rain. The fanny pack comes with stable water bottle holder that has elastic rope included keeping the water bottle secure. Though many people said, the water bottle holder is not as effective as advertising. But I guess it is fair enough. Also, it has an adjustable buckle belt that is comfortable to wear. You can adjust it according to your need. Besides, the buckle closure makes it easy to take on and off. The pack is easy to clean and definitely an ideal choice for the price. 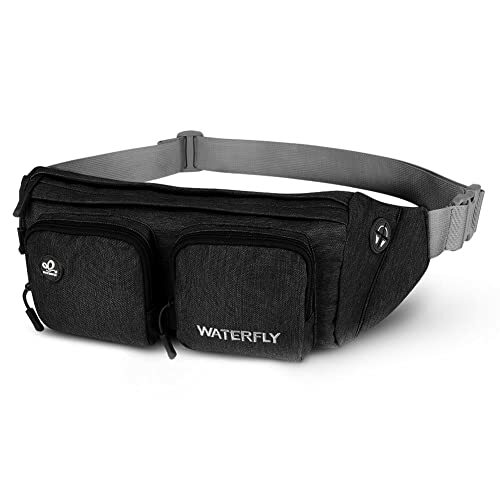 WATERFLY is one of the biggest names in this industry that makes and sells quality waist pack at a reasonable price. This WATERFLY Fanny Pack is another excellent example of their quality. The pack is well-constructed with a premium quality water resistant material. That means, it can even serve you in heavy rain. It is durable and anti-abrasion. The size of the bag is standard, and it has plenty of pockets with enough room. You will get five separate zipper pockets in total. 4 of the compartments in the main pouch will let you keep phone, keys, and cards separately. Also, the pack has an earphone hole on the front side. If you are a music lover, you know how important this little hole is! It is well-ventilated and comfortable to wear. The price is also reasonable for such quality. 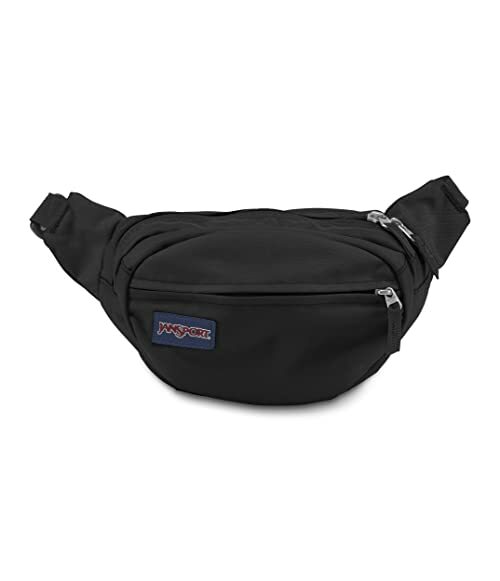 The JanSport Fifth Ave Waist Pack is widely popular due to its excellent construction quality and practical performance. 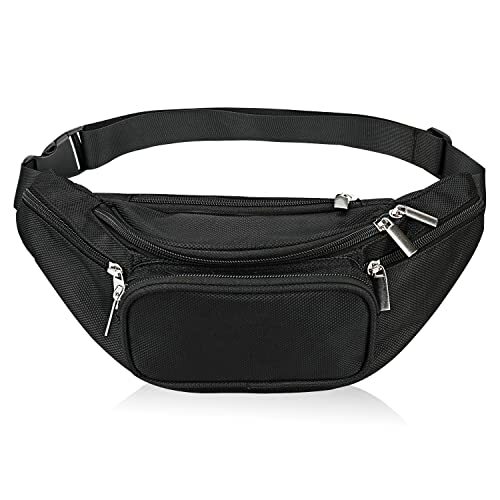 The fanny pack is made of durable 600 denier polyester materials. The straps and zippers are also high in quality. If you need something long lasting, this is what you need to pick right away. It is everyday and everywhere bag. The size is standard, and it is lightweight. Besides, it comes with comfortable straps and offers two different carrying style. That’s what makes it easy to carry in your everyday life or on any outdoor trips. The fanny pack also has plenty of room in different pockets. You can keep everything well-organized. The color and prints are attractive as well. Overall, the price is not prohibitive as well. For hiking, this is an amazing fanny pack you can pick right away. 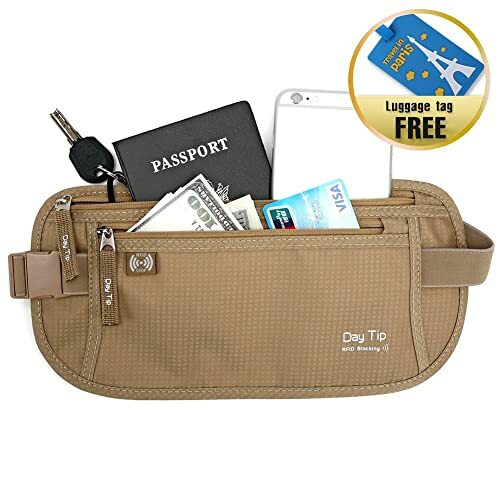 The best part of the Day Tip Money Belt is the design which is attractive as well as user-friendly. The pack comes with separate pockets for mobile phone, key, and other little accessories. Also, it has two pockets included with zipper. The rear of the pack has moisture absorbing mesh panel that makes it sweat resistant. The bag is well-constructed with an excellent level of craftsmanship and highest quality materials. It is made of 100 blocking RFID and waterproof 210D rip-stop Nylon. Meaning, it is designed to last several years without any problem. You can use the fanny pack for hiking, mountain climbing, camping, running and even in everyday use. You can keep your money in it along with passport and other important documents. The price is reasonable for such quality. Pick quickly before the stock turns out. Has two pockets with zipper. 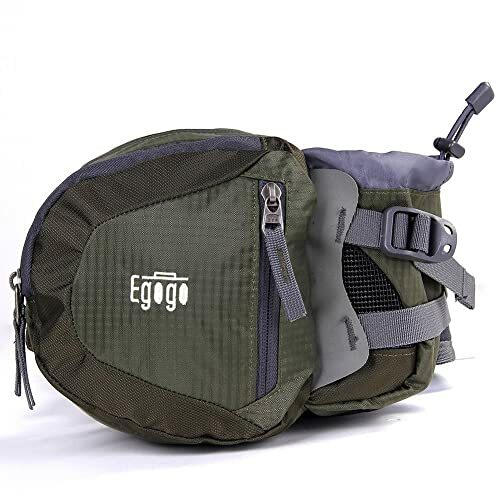 The EGOGO Travel Sport Waist Pack Fanny Pack is another excellent option not only for hiking but also for any outdoor activities. Besides, it is ideal for everyday use too. The construction quality is amazing with rip-stop lightweight nylon. The zipper is also high in quality, and the strap is well-constructed. The product is made to last. However, it offers three different compartments that have enough storage space. You can keep essential items well organized. You can even keep ID cards, keys, cash, camera, phone, and snacks whatever you want. You will also get a practical water bottle holder on the right of the waist. The holder also has a strap to keep the water bottle in the right place. Also, in the small zipper pocket, you can keep little items like tissue paper. The price is pretty decent for the quality. The Fanny Pack 5-Zipper Pockets Nylon waist bag is the example of quality craftsmanship. Excellent craftsmanship and premium quality materials make it one step ahead of its competitor. If you maintain properly and clean it perfectly, this bag has the ability to serve you a lifetime. The bag offers five different storage compartments. Meaning, you can keep every little thing near your hand. The zipper quality is amazing as well as the waist belt. The waist belt is adjustable according to your need. The fanny pack is waterproof. You can use it in the rain. The design is light, compact and thoughtful. That makes it attractive and user-friendly. Overall, it comes at a decent price for such kind of quality. So, the stock will expire soon enough. Don’t be late! 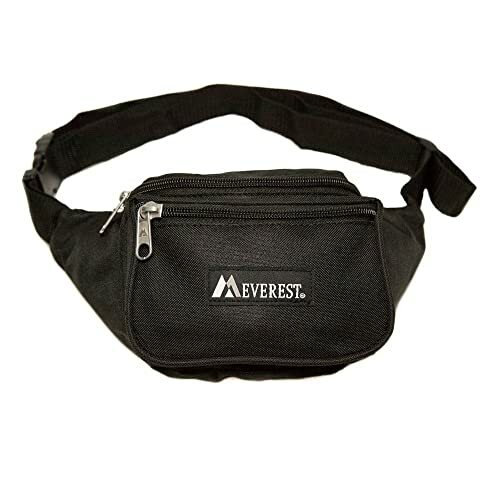 The Everest Signature Waist Pack is another amazing option for the price. It is well constructed with high-class materials. The design is attractive and thoughtful. That means the item will last several years without any issue and also makes you happy with its clean performance. However, the size of the bag is standard. It is not very heavy. You can comfortably carry the pack with snap waist buckle and adjustable waist strap. The Fanny pack also offers three zippered compartments where you can keep all your valuable items. The price is not prohibitive as well. It is a great product to have in your next outdoor adventure. Click the link below to see the full details of the product. Hurry up the stock is limited! AIKELDA Fanny Pack is our last entry in this list. 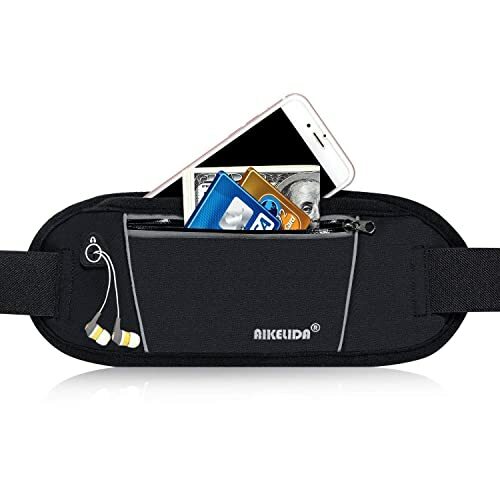 It is a lightweight waist bag which is incredible for the price. Though lightweight still the construction quality is durable. The item is made of high-quality materials which is why you don’t have to worry about the durability. The pack offers plenty of space to keep your phones, cash, key, watch and so on. It will provide ultimate protection from water, sand, dust, and dirt. The utility belt pouch is suitable for outdoor sports, workout sessions, running, hiking, hunting, jogging, cycling, traveling and so on. The price is reasonable as well. If you need this one, you should link the link right away. Why? Because it is a popular product and the stock is limited! FREETOO Waist Pack Bag is made of strong 1000D polyester with an excellent level of craftsmanship. So, it is strong, long lasting as well as soft and comfortable. You can use it for walking, running, biking, hiking, traveling, festivals, concerts or any outdoor trips you like. The bag comes with five separate zippered pockets. Each pockets different in size, but they offer enough storage space. In the large pocket, you can keep a standard sized water bottle. Besides, in a hidden zipper compartment, you can keep important things secure. The zippers of the pack are also high in quality. It also features a flexible strap with a strong and reliable buckle that ranges from 30-42 inches. You can even adjust according to your need. The adjustment process is easy. You will be allowed to use different wearing style as well. The price is acceptable for the quality. A fanny pack is ideal for shorter hikes in stable weather. Depending on your preference you have to decide which one from the above list is right for you. I mean, there are options with different types to choose from. You can have large packs, medium packs or small packs according to your need. Anyway, we already shared some of the best fanny packs for hiking where you will find every sort of options. All the products above are highly constructed with premium quality materials, thoughtfully designed and reasonably priced. They differ from each other in some features that’s all. Now let me tell you in the comment section which product seems more suitable for you? Also, ask anything you need to know about the fanny pack. Our experts will surely solve all your confusion. For now, I am leaving you here. Let me remind you; we will keep sharing some other effective tips, tricks, life hacks, and essential outdoor product reviews each week. Don’t miss anything and don’t forget to give us your feedback! The 10 Best Hiking Gloves in 2019 – Top Picks Review Every avid hiker knows the importance of hiking gloves.